In Reply We thank Cochran et al for their insightful comments, and we agree that our study1 on health disparities in the lesbian, gay, and bisexual (LGB) population adds to the mounting body of evidence that people who identify as LGB experience worse health outcomes compared with their heterosexual peers, potentially due to the stressors that LGB people face as a result of interpersonal and structural discrimination. As Cochran and Mays have previously noted, “research on LGB populations is still in its infancy,”2 compared with health disparities research on racial and ethnic minority populations. Other researchers have also noted that the work to resolve health disparities in the LGB population has barely begun.3 Our study helps broaden the knowledge base on LGB health disparities to the readers of JAMA Internal Medicine, as it is imperative for clinicians to understand, accept, and address the health needs of LGB and transgender (LGBT) patients. 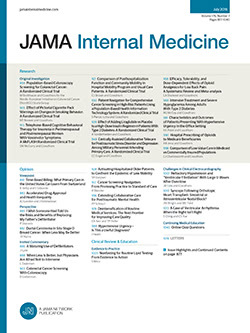 We encourage JAMA Internal Medicine to continue publishing important findings documenting LGBT health disparities and best practices for eliminating those disparities. Doing so will help health care providers implement positive changes in their practice. Meanwhile, recent developments at the National Institutes of Health will help build the research capacity for LGBT health. Specifically, the National Institute of Minority Health recently designated sexual and gender minorities as a health disparity population for research purposes.4 This designation will broaden funding opportunities and research on LGBT populations, among other sexual and gender minorities. We commend these efforts and encourage high-impact journals, like JAMA Internal Medicine, to continue reporting new discoveries and advancements in LGBT health.